Let me catch you up on the chickens. In short, they’ve grown up. Sometime in July, Goldie layed her first egg. She graced it upon our neighbor who was chicken-tending during our victorious summer of camping. I’ve never experienced the chicken coming-of-age transition before, and let me tell you it is A Thing. In the days before The First Egg, the girls were small, skitterish, made little peeps and clucks, and made staying out of our way their main business. Here is what our neighbor relayed to me about The Day of The First Egg. Before she’d even discovered it, she knew something was going on. The ladies were strutting and squawking like narcissistic high school seniors at prom. Bless our neighbor for recounting this by shuffling around our front yard with her elbows angled just so, her neck bobbing out and in, and for saving the first few eggs for us to see. She intuited that this was also a very big moment for me. It was. I crooned over them. They were so perfect and small. Little starter versions of real, live eggs. And they were delicious. It was a miracle to see them sputtering to white in the cast iron skillet I inherited from my grandmother. 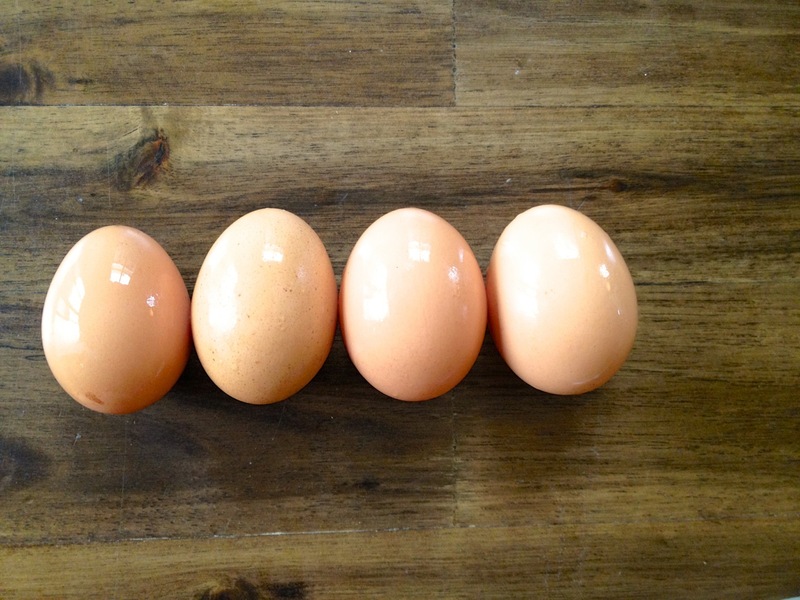 Over time, the eggs have gotten bigger, and now they’re your standard medium/large that you get at the supermarket. Except for the fact that they’re a sepia rainbow. And Mavis’ are always this amazing blue-green color and more oblong than the rest. We’ve also gotten a few whoppers. Like one from this morning that we cracked open to find 2 yolks inside. When I first layed eyes on it, I audibly winced. I hope she did some deep breathing when that one was coming out. Now, our gals are routine and established layers. We usually get 3-5 eggs per day. The bounty is amazing. And of course I have slipped into the mundane routine of it all, but I still get shocked into awe by the cycle we’re part of. We throw our cast off cheerios and weeds and apple cores and rotting pumpkins into the run (in addition to their pellets and scratch), and in exchange, these birds make us food and fertilizer. Every effing day. That daily wheel of give and take brings me back to the human animal I am. And even though I can be found hemming and hawing in bed about having to go outside to let the chickens out, I can also be found whispering “thanks gals” into the nest box in the afternoon. Really. Thanks gals. You’re doing a bang up job. Thank you for the sharing the joy of discovery. 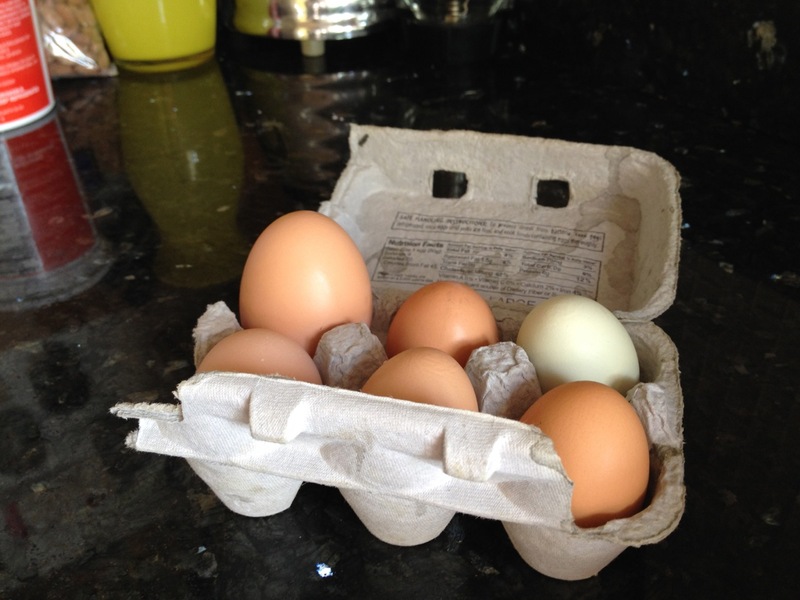 Sometimes the simplest (for us, not necessarily for the egg-laying gals) things remind us of the wonder of life. And a shout out to your neighbor for sharing the important day. Oh man, this makes me miss having chickens. It is just like you said. Grumbling about letting them out in the morning, but totally grateful a few hours later. Chickens are the best. Awww! I used to help care for my landlady’s chickens where I used to live. I’ve never had enough room to keep any sense. But in case I do … how do you keep them warm in winter? I’ve had laying hens for 16 years now. I am as excited about the first pullet egg now as I was 16 years ago. There’s a lot of comfort in knowing I have healthy, fresh food from healthy, happy birds. Amen, Robin! Have you seen that crazy behavior shift after the first egg with your gals over the years ?! I just thought I’d mention that your writing style is fantastic and I hope that one day my blog evolves into something like your own. I recall the excitement of my girls first egg last summer. So small and precious. One of my friends went to gather some the next day and was so blown away by its beauty. She whispered “oh my god, it’s perfect” and then seemed surprised by her reaction. After all, we’ve all seen eggs before right? But it is perfect. In shape and color. But also what it symbolizes when you have a flock to tend. You essentially brought those perfect forms into reality. It truly serves to connect and ground you a bit. By the way, the one photo it looks like you’ve washed them. Was that right before eating them? I like to leave mine out on the counter because refrigerating them reduces the flavor. But once you wash them, you have to refrigerate. Once that protective coating is removed bacteria becomes an issue. I’ve also read that you should wash them in warm water because cold water shrinks the yolk and more bacteria is drawn in. You most likely know all this, but maybe your readers don’t. Great tips, James! I had heard the same about washing but haven’t really put it into practice yet. And its so true…they are so perfect…thanks for reminding me of that bit of magic. Anytime you need magic reminders, I’m your man! My head is in every cloud. Cheers. So I see 🙂 Let’s stay connected! Type in your email address, and the fancy ol' internet will email you when I post something. Nothing says Easter like goat earrings. Turns out, when you have more than enough money, you can buy the vacation that the powers that be have made you want for like your whole adult life.